Cardinal Pimiento, one hundred years and seven Popes: "Discernment and wisdom to overcome polarization"
Expocatolica 2019: a great meeting space to "continue to walk together"
Bogota (Agenzia Fides) - The European Parliament, the French Parliament, the British Government, the Commissions of the Episcopates of the European Union, France, England and Wales, Internationalis and German Caritas, as well as other Catholic cooperation agencies, received the visit of some representatives of the Colombian Episcopal Conference (CEC) in mid September, with whom they talked about the ongoing and necessary cooperation in this critical moment for their Country. Mgr. Héctor Fabio Henao, National Director of Social Pastoral-Caritas, who accompanied the President of CEC, the Archbishop of Villavicencio, Mgr. Oscar Urbina, told Agenzia Fides that "although what happens in Colombia does not have great media impact, we have nevertheless perceived interest, concern and willingness to cooperate, on behalf of the institutions visited, to alleviate the situation of those seeking protection in Colombia", ie the victims of armed conflict, the hundreds of thousands of Venezuelan migrants and social leaders in danger of life. For each of these three areas, projects are implemented with the collaboration of some of the European institutions, first of all Caritas, with its working group for Colombia. "Colombia has taken a very important step in the building of peace: the international community must maintain the attention and solidarity towards our country, which is still in a critical situation", warns Mgr. Henao. "It was known that there are many violent protagonists in Colombia, and that it was not enough to make peace with FARC. We could have imagined that they would try to take control of the territories that FARC left free", he explains. In the meetings of Brussels, one of which the President of the European Parliament, Antonio Tajani was present, what was highlighted is the fact that the current migration crisis in Colombia, which originated in Venezuela, is "humanitarian, and not just political" and requires urgent action. Attention was paid on "the global pacts on migrations and refugees that are being signed at the moment and on the need to adapt international instruments to adequate and integral assistance". 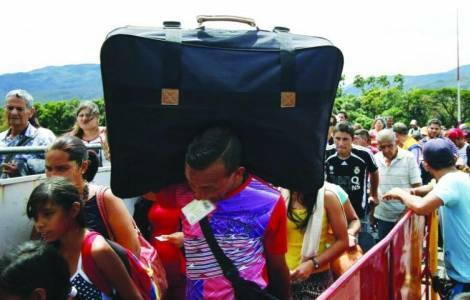 The Colombian delegates drew attention to the complexity and depth of the Venezuelan migration crisis, which "must be seen in the framework of a much broader legislation than the traditional one, considering the needs of this population". Mgr. Urbina and Mgr. Henao emphasized that in these situations "the great solidarity of the Colombian people and its enormous capacity to give hospitality" emerged, together with the need to "integrate migrants in Colombian society and offer them protection, in a complete framework that contemplates their rights". Mgr. Henao, however, did not find on the European side the precise intention of "a monitoring and a permanent evaluation of the most urgent needs and the way to resolve them".